After six years of full-time touring all over the U.S., Canada and Europe, meeting other musicians and gathering tunes all along the way, by 1992 Helicon’s repertoire was all over the map, and their focus as a group had shifted to finding a common ground in traditional folk music from around the world. Horizons, their third CD, includes tunes from Greece, Macedonia, Romania, Finland, Sweden, Peru, Argentina and Brazil, along with Irish reels and American fiddle tunes. This one is Helicon at its most eclectic. Originally released on Dorian Recordings in 1992, the third of Helicon’s four recordings (and fourth pairing of Chris Norman and Ken Kolodner) presents the broadest range of repertoire for the trio of any of their recordings. While the trio made no pretense of sounding authentic in presenting music from South America, Eastern Europe and elsewhere, the group always attempted to capture the spirit of the music. This remastered version significantly improves the sound quality. Helicon began life with Chris Norman and Ken Kolodner in the early 1980s. A fortuitous meeting at a festival added the prodigious talents of Robin Bullock in 1986 and Helicon was officially born. The trio soon became one of a number of ensembles who were at the forefront of expanding the boundaries of traditional music in the U.S. and exploring the genre of what became known as “world music.” Combining diverse musical backgrounds and interests, Helicon’s mission became the interpretation of traditional folk music from around the world. The group took its name from Mount Helicon in Greek mythology, the home of the nine Muses who each inspired a different discipline in the arts. 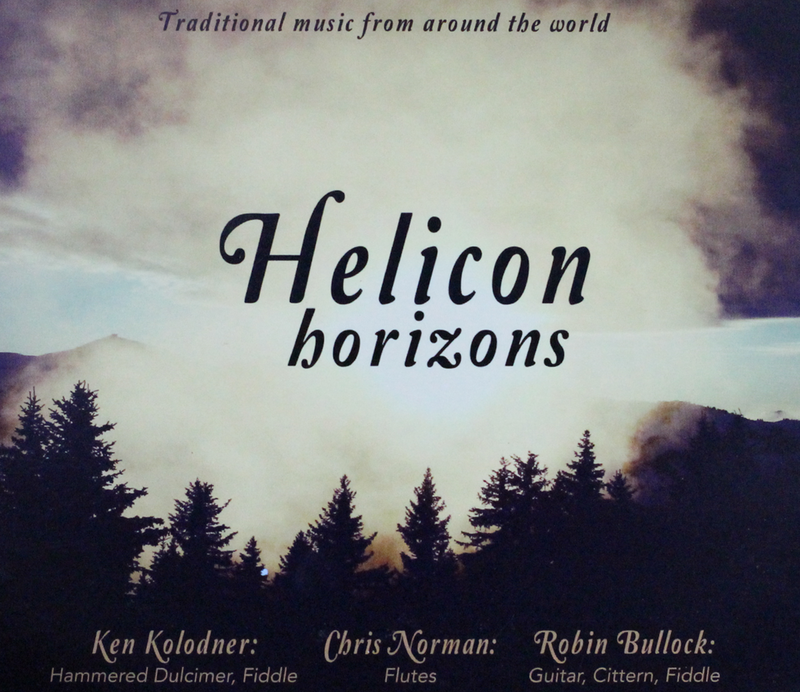 Helicon’s high-energy performances feature a repertoire that is astoundingly varied, ranging from music of South America and Eastern Europe to Celtic and Appalachian fiddle tunes to music of the Far East. Helicon stopped touring in 1998 but still reunites every December for their annual Winter Solstice Concerts in Baltimore, MD.